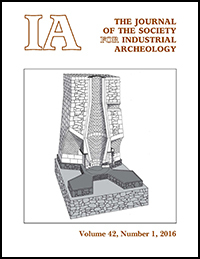 IA is the principal forum for the publication of current research in industrial archeology. Each issue of this peer-reviewed journal contains scholarly articles, essays and book reviews. IA and its companion, the SIA Newsletter, are mailed to all current SIA members. New members are sent the latest IA immediately after joining. (IA Journal: ISSN 0160-1040) Articles appearing in IA are abstracted and listed in Historical Abstracts and America: History and Life. Printed issues (or photocopies for out-of-print issues) are available for purchase for all of the IA journals published since Vol. 1. Current SIA members receive a discount on purchasing back issues. Please contact sia@siahq.org for details on purchasing copies of out of print issues.